Minolta 80-200mm F2.8G HS APO at 200mm F2.8. Sony 70-300mm F4.5-5.6G SSM at 150mm F5.6. I’d have to say it’s a fair tie in image quality. Other factors like practicality start to take precedence – the Minolta is nearly twice the weight of the Sony, and has a poor minimum focus distance of 1.8 meters. The Sony does 1.2 meters close no matter what. Of course, the Minolta can do F2.8 at all focal lengths. 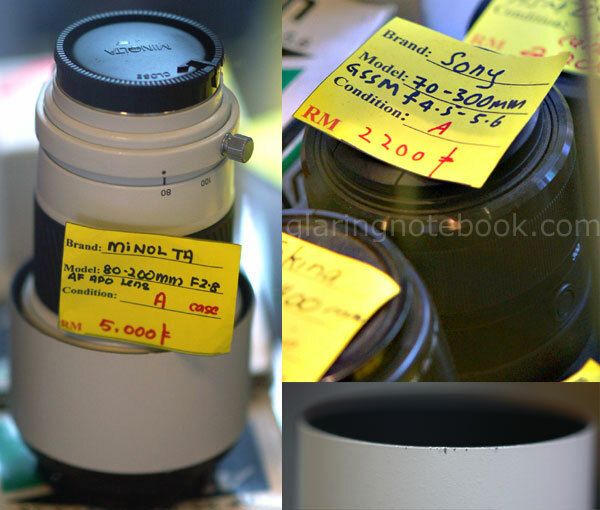 And then I went to Sony Style KLCC to find out if the Sony 135mm F2.8/T4.5 Smooth Transition Focus was affected in image quality by the Sony 2x APO Teleconverter. Yes, the Sony counts 135mm with a 2x TC as 280mm instead of 270mm for some weird reason, but I’ll refer to it as 280mm anyway for the rest of this entry. 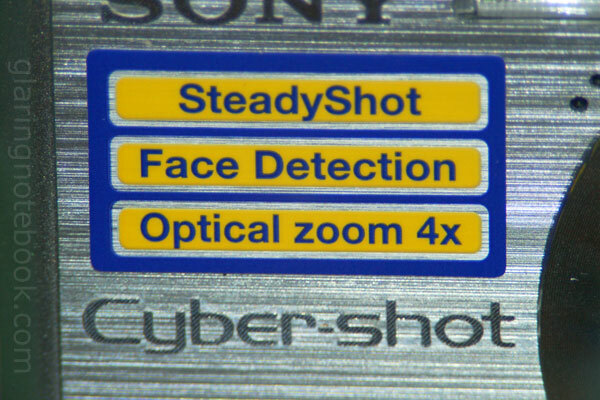 So, I could conclude that the Sony 2x APO Teleconverter does not degrade the bokeh of the STF lens. Does it degrade sharpness? Not by much of a noticeable bit for me. 100% crop of the 280mm T9.0 1/80s ISO3200 shot. However, it does bring out some chromatic aberration. 100% crop of the 280mm T9.0 1/80s ISO3200 shot. I shot X-Fine Large JPG which isn’t the best way to bring out the image quality of the A900 but this was a quick snap, all other factors the same. 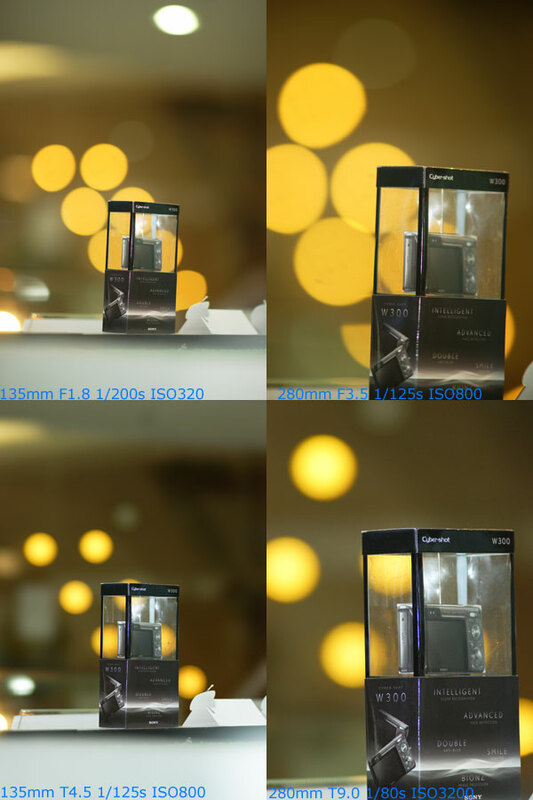 Height comparison to my Minolta 50mm F1.4 Original. Physically though, the Sony 2x APO Teleconverter has its front element sticking out further nearer to the mount, while my Kenko 2x MC4 is quite deep inside. 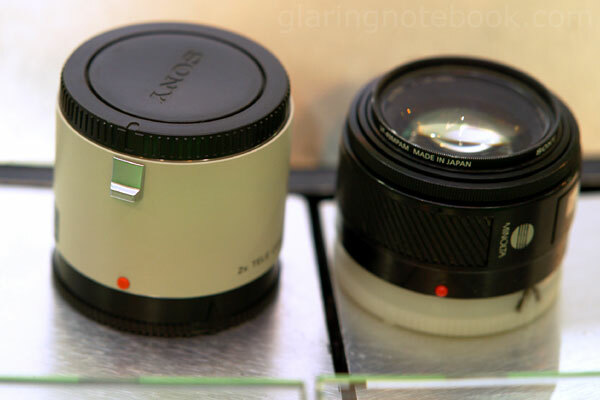 The Sony is fussy – you just cannot physically mount most lenses in front of it because of the front element. On the plus side, it’s optically better because of this. It fits all the non-black Sony lenses, with the exception being the STF. 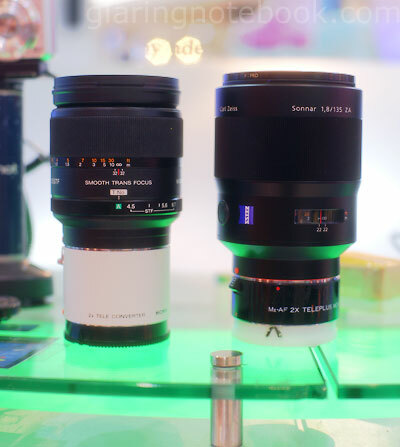 So that means the white Sony 70-200mm F2.8G SSM, Sony 300mm F2.8G SSM, Sony 70-400mm F4-5.6G SSM and Sony 135mm F2.8/T4.5 Smooth Transition Focus. My Kenko, meanwhile, accepts any lens or teleconverter. So I could stack it! So does that mean I can stack the teleconverters? Of course, though only in a certain order. 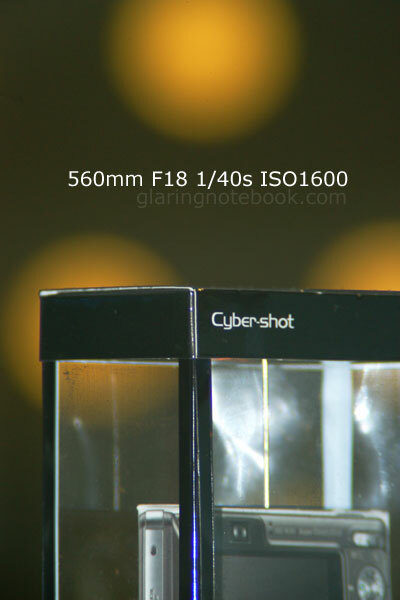 So here’s the result, 560mm F18 1/40s ISO1600. Also at 560mm F18 1/40s ISO1600. The STF gives 1:4x magnification, and putting a 2x teleconverter doubles the magnification. 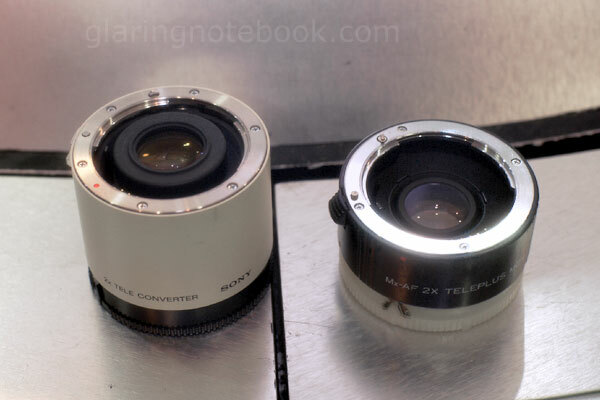 Obviously then, putting two 2x teleconverters quadruples the magnification to give 1:1x life-size magnification! Okay, so shooting macro with a full-frame isn’t all that great. – on an APS-C body, 280mm gives the equivalent of 420mm which is long and hard to use. Already the STF without teleconvters is hard to use on APS-C for portraits due to the length. On a side note, how do you secure your camera from flying paintballs? 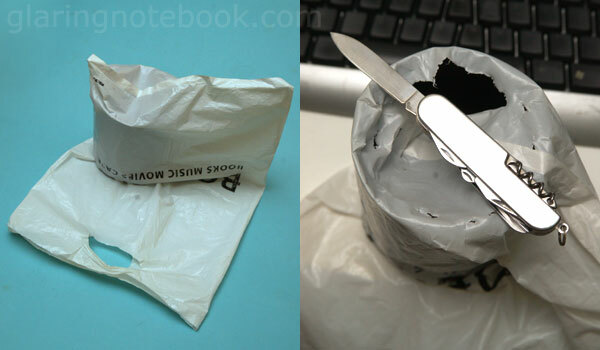 Using a thick plastic bag! Left: Put the hood in the corner. Right: Carve out a hole using a knife or a pen. Finally, tape it to the hood! Here’s my Carl Zeiss 135mm F1.8 with my Minolta Dynax 7, all inside a Borders plastic bag! Not rain-proof completely as the back is still exposed, but it is covered enough for splashes and paintballs! 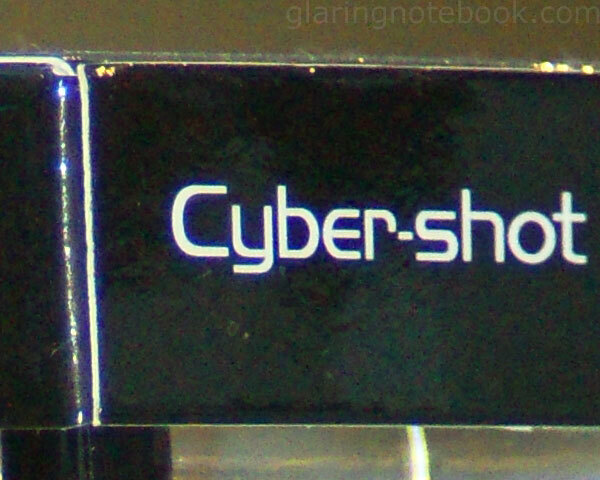 This entry was posted in Geek, Pictures on April 22, 2009 by 2konbla. I like the paintball bag! ok, that’s something though I’ve seen someone (the one that got his lens shattered to pieces by the pellet) wrapped his camera in a black plastic bag – but I prefer this one. anyway, im thinking of making a bracket with some perspex to cover the lens alone for the next paintball tournament. WOWO! Poison session is in order!!! 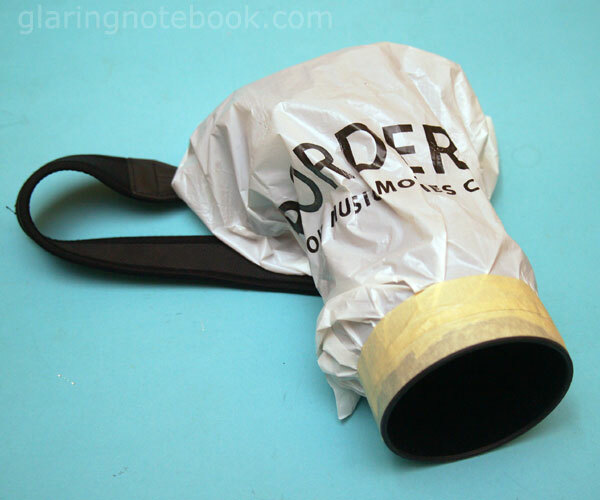 OH OH what a cool idea on how to make a cool protector for your lens! It doubles as camouflage! Who is going to think that the Borders bag is a camera till you raise it up to eye level? Plastic bag is a nifty idea. 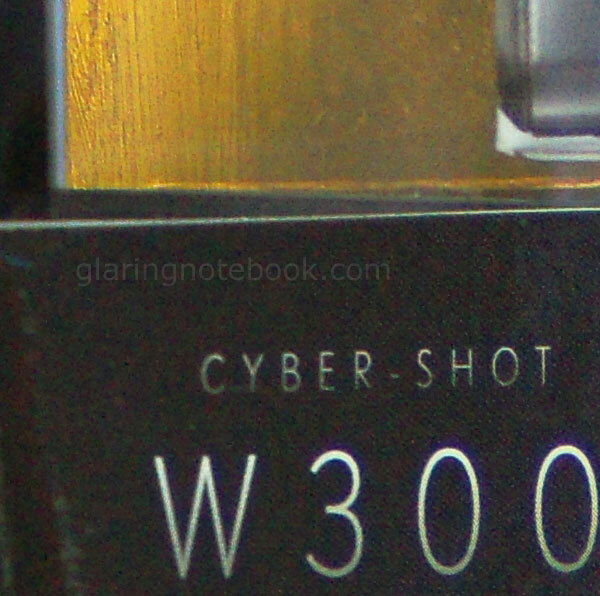 The Minolta 80-200mm f/2.8 has a screw or a stud-like thing near the mount (silver thing visible in the top image). What’s that? Focal length lock? what happens if a paintball comes flying straight for the front of the lens? dreamingArtemis: Heh, and if the bag was strong enough, I could hold it by the handles! Tan Yee Wei: The screw tightens the tripod mount, which can be rotated around the lens for portrait mode. saifulrizan: That would look quite cool also LOL. Like that annoying Counter-Strike shield. Hanna: Anything really would work, if you’re not expecting a major upgrade from the a D40x. noel: Well you try to avoid that situation. That said there should always be a UV filter to protect the front element from impact!